Shaded areas can be a bane to gardeners craving bright, bold perennials. For those gardeners uninspired by a shadowy showcase of lacy ferns and large-leaved hostas, take heart. The bleeding heart reigns as queen of the shady ladies – outshining them all with vivid pink and crisp white heart-shaped flowers suspended in a neat line along gracefully curved branches. 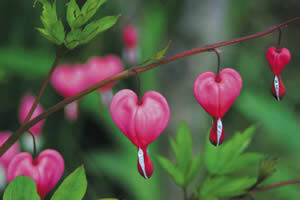 Some flowers cry for attention, but bleeding hearts demand it. Known as Dicentra spectabilis, the flower has worked its way into many a gardener's heart and has inspired such lyrical names as lady's locket, lyre flower, valentine flower, Venus' car and lady in a boat. Native to eastern Asia, this quick-growing, clump-forming perennial has been gracing gardens for more than a century, and is well loved for its early blooms and ability to thrive under variable conditions. Carol Souza of Weezingreens Nursery in Seward purchased her first bleeding heart from a grocery store more then 15 years ago. Today, the hardy plant stands nearly five feet tall and is nearly as wide – making its presence more like a shrub than flowering plant. "They get heavy with bloom and will tip under the weight of the limbs if they aren't supported," says Souza. As an added measure of control, Souza reins in the roots on a regular basis. Every two years she digs it up and divides it, getting as many as 25 starts from the one plant. "They have an amazing root system," says Souza, "and once they are established, they are very hardy." While bleeding hearts in other parts of the country die back after their spring bloom, the dripping spikes of pink and white flowers tend to stick around all summer long in Alaska gardens – especially in the moister, cooler climes near the coast. And unlike most parts of the country, the mild climate of southern Alaska will support bleeding hearts planted in direct sun. "They will grow in the sun, but they will go through their cycle faster," says James Faltz of Faltz Nursery in Anchorage. "They do best when planted in shady areas with damp, neutral soil." Other popular species of bleeding hearts found in Alaska include Chinaman's breeches (Dicentra spectabilis f. alba), which bears graceful strings of all-white flowers, and fringed bleeding hearts (Dicentra eximia), prized for their dusty-pink blooms and lacy foliage. Most bleeding hearts make their spectacular showing as early as late May and will continue blooming into late August and early September. However, the blooming season is dependent on sun exposure, soil condition and variations in the climate. "They are the one plant we always design in the shade," says Faltz. "They just keep getting bigger and bigger."